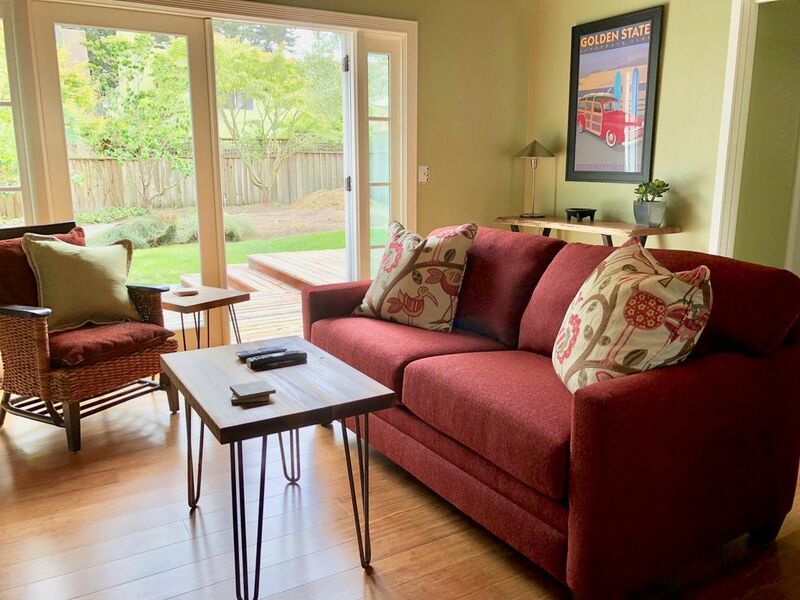 This charming cottage, perfect for a romantic getaway or a family vacation, is located on a quiet cul-de-sac just steps from the 26th Avenue and Moran Lake Beaches. Beachbreak Bungalow is a wonderful hideaway for your vacation in Santa Cruz. Moran Lake Beach & 26th Avenue Beach are a two minute walk down a serene nature trail, along a beautiful grove of Eucalyptus Trees -- the perfect spot for those seeking solace on a huge boulder, pelicans and crashing waves, family-time building sandcastles, swimming in the surf, or a beautiful sunset stroll. The home has 3 bedrooms and 1 bath, with a queen sized bed in the master, a double bed in the 2nd bedroom, and a double futon bed in the third bedroom. The bathroom has a shower with a full bathtub. There is also an outdoor shower with hot water - great for rinsing off after a trip to the beach, and the kids always love it! The large, beautifully lanscaped backyard is wonderful for a relaxing family BBQ where you can enjoy the company of family and friends or just relax and listen to the sound of the waves. The house is immaculately clean and well furnished with everything you need when you want to get away from it all. Downtown Capitola with it's lively beachside restaurants and shopping is a short 5 minute drive as is the Santa Cruz Harbor with it's many boating activites. This the perfect central location for your trip to Santa Cruz! We love the beach and have spent many summers there together as a family over the years. We feel like any trip to Santa Cruz should include our canine companions since they are part of the family. Nothing compares to the serenity and beauty of the beach, so we do our best to spend as much time there as possible. This gem of a cottage caught our eye when we were dreaming of owning a beach house and somehow it magically worked out and become ours. It brings us much joy and pleasure and we are happy to share it with our guests. This property has the most amazing location. It is next to a lake and path that takes you to an incredible cozy dog friendly beach. The back yard was also a highlight. We will be back with our dog soon. This house worked very well for us - nice quiet location, clean house, outstanding back yard (which is rare in this area). Had some issues with the heat, but Amy and her husband addressed it right away. Loved building a fire in the fireplace! We would stay here again! Lovely hosts and cozy home - perfect for families! Many thanks to our wonderful hosts for a cozy Thanksgiving holiday at their lovely beach home. My family and I roasted marshmallows over a warm fire and had a marvelous time while visiting family and friends in Santa Cruz. Highly recommended! You’ll love the huge backyard, charming abode and thoughtful amenities. We’ll be back! Our whole family had a lovely time at this relaxing beach house, including the dogs. :-) The location was perfect and we really appreciated the new furniture in the living room. The changes made the living room feel much more open and easier to navigate with a small child and two big dogs. Amy was a wonderful host and we really appreciated all of the information in the welcome documents. Thank you so much for sharing your beautiful home with our family. Cozy, clean, great location. Dog friendly and so close to a dog friendly beach, you can't beat it. Backyard is very large and has several sitting areas, this was nice for my teenagers to hang out when not at the beach but didn't want to be with the adults. The house is nicely decorated with comfortable beds and linens, plenty of good quality towels. Kitchen is pretty well equipped. Backyard and grill excellent. Only one small bathroom, but for vacation it didn't matter. The area is great for walking, very accessible to everything. Amy is an awesome host. She has left a notebook with heaps of info and guidance for a great stay. Will definitely return.